What are you finishing today? Project 2013 ships with "Tasks Due This Week" filter. This filter shows detail tasks with finish between the start and end of the current week. What if you want to display the tasks due today? 1. On the View tab, click the down arrow of the Filter box to display the drop-down menu and then select New Filter in the menu to open the Filter Definition dialog box. The value string “Today is:”? 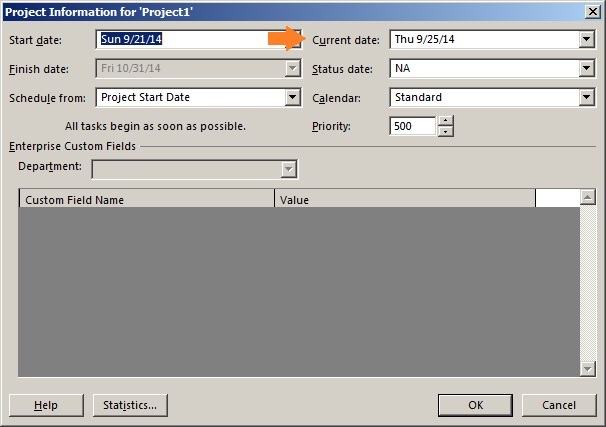 evaluates to the Current Date field entered in Project Information dialog box. If we use a different prompt string, for example, "Enter a date:"?, then the filter asks for a date to compare with the task finish dates. So, what are you finishing today? Where is the current date used? Where is my current date used? What is so special about this? Should I care about it? These are the questions you will get on looking at Project Information dialog (Project ribbon, Project Information command). This field is special. It updates itself with the system date every time you open a plan. The date in this field is used in multiple places within Project. 3: To update work as complete through the current date click Project, Update Project command. Note: In Update Project dialog, though the default date is current date, Project defaults the time to 5:00 pm. How to calculate planned % Complete? Time. Task Progress. Are they different? Submit Time and Task progress in one screen. Are you crazy?